Your college dorm room decor is incredibly important. It will make your college dorm room feel like a comfortable home, but it will also make your college dorm room a cool hang out place. Your dorm room decor can be more than your dorm bedding and dorm rug. You don't want to forget to add dorm room decorations to your college dorm room walls to make your dorm room feel even more like home! Cheap dorm supplies like college posters are cheap and easy ways of making your college dorm room look great. Plus they will cover up those bland dorm room walls! As you're dorm decorating, don't forget about your college dorm room door! You can decorate more than just your dorm room walls for a comfy, cool, hangout place. Your college dorm room door is a dorm item you shouldn't forget about when you're adding dorm room storage to your dorm room, and you also shouldn't forget about it for dorm decorating! 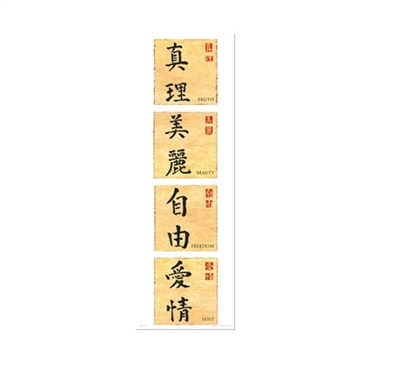 Our Chinese Writing 2 College Door Poster is an oversized dorm essentials item that will look great on your dorm room door, college closet door, or even on your dorm room walls! This dorm necessities item features Chinese writing on a light wood colored backdrop to add delicate style to your college dorm room decor. Turn your college poster into dorm wall art with our Chinese Writing 2 College Door Poster in your college supplies!